Photographof costumed man on bicycle at Heritage Village (now Burnaby Village Museum) on opening weekend, November 19-21, 1971. 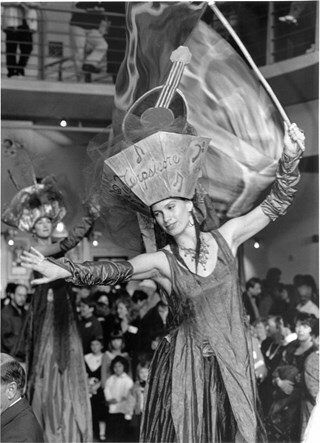 This is one of hundreds of photographs from BC Centennial 1971 events in Burnaby. Contact Burnaby Village Museum for information on the rest of this collection. Photographof Roland Michener, Governor General, giving speech at the official opening of Heritage Village (now Burnaby Village Museum), November 19, 1971. On his left, from left to right, are J. A. Barrington, Chair of Burnaby's Centennial Committee, Mayor Bob Prittie, and Sandy Stewart, Chair fo the Centennial Subcommittee that oversaw the development of Heritage Village. 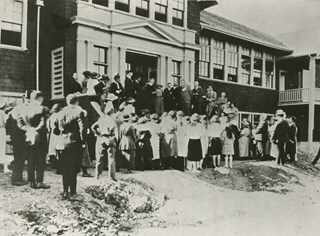 Photograph of the opening of Seaforth School, Burnaby Village Museum. An annotation on the back of the photograph reads, "X-students of Seaforth School following Brig. 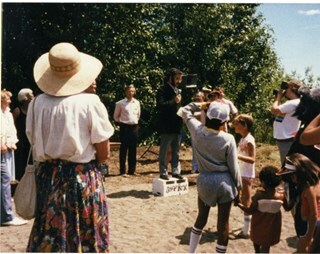 Bell-Irving / April, 1987 / Dedication of Seaforth School - Bby Heritage Village." The school was moved from its original location at 7881 Government Road to Burnaby Village Museum in 1983, and was opened to the public in 1987. 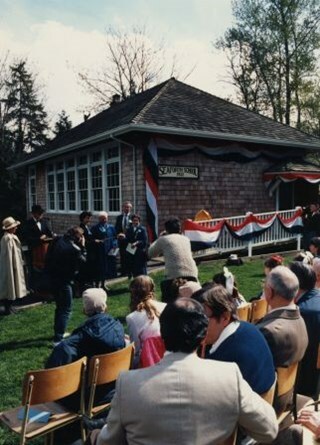 Photograph of the opening of Seaforth School, Burnaby Village Museum. An annotation on the back of the photograph reads, "Dedication ceremony, Seaforth School, Bby Heritage Village, April 1987." A crowd of people is seated on chairs and standing at Burnaby Village Museum. Buildings and Tram #1223 can be seen. 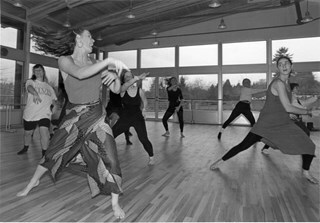 The school was moved from its original location at 7881 Government Road to Burnaby Village Museum in 1983, and was opened to the public in 1987. 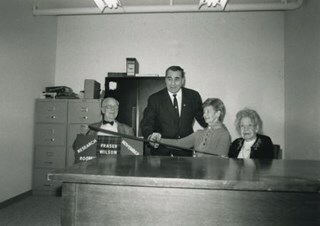 Photograph of Mayor Copeland helping Evelyn Salisbury to cut the ribbon at the opening of the Burnaby Historical Society Archives' Fraser Wilson Room. Fraser Wilson is holding up a sign that is partially obscured by the table that reads: RESEARCH ROOM / FRASER WILSON / NOVEMBER 15 1990. Violet Eagles is sitting to the left of Evelyn Salisbury. Fraser Wilson was the first Director of the Burnaby Historical Society. 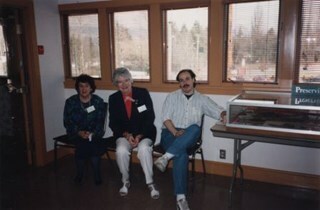 Photograph of Pixie McGeachie, Hazel L'Estrange, and Jim Wolf sitting inside at the opening of the Burnaby Community Archives at the Burnaby Village Museum. 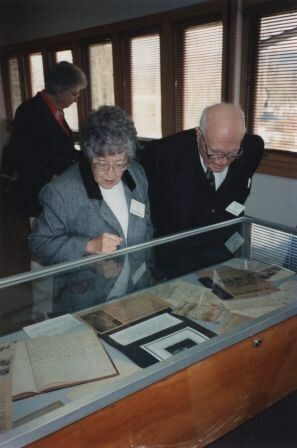 Photograph of John and Elise Burton looking at archival materials inside a display case at the opening of the Burnaby Community Archives at the Burnaby Village Museum. 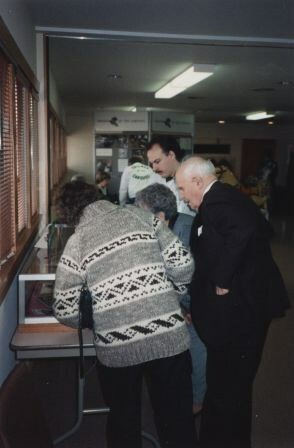 Photograph of John Burton, Elise Burton, Jim Wolf, and another man looking into a display case at the opening of the Burnaby Community Archives at the Burnaby Village Museum. 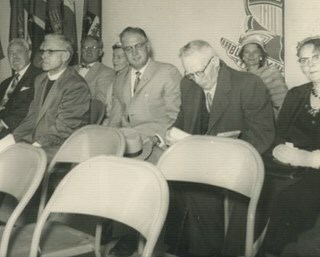 Photograph of John and Elise Burton, along with other spectators listening to Mayor William J. Copeland address the crowd at the opening of the Burnaby Community Archives at the Burnaby Village Museum. 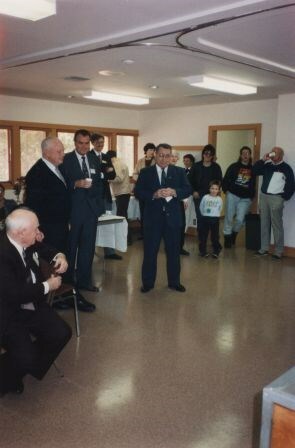 Photograph of curator Colin Stevens, and Mayor William J. Copeland, both wearing striped ties and glasses at the opening of the Burnaby Community Archives at the Burnaby Village Museum. A crowd is gathered to listen to the Mayor. 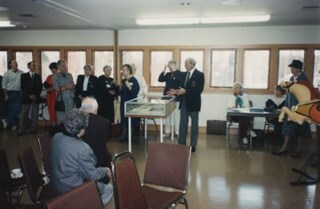 Photograph of Don Brown and Mary Forsyth talking to the crowd that has gathered at the opening of the Burnaby Community Archives at the Burnaby Village Museum. 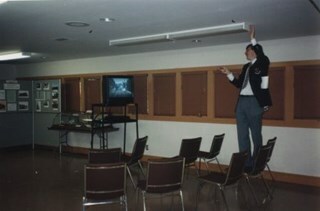 Photograph of curator Colin Stevens standing on a chair while setting up audio-visual equipment at the opening of the Burnaby Community Archives at the Burnaby Village Museum. 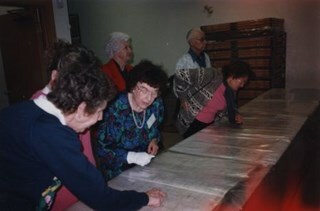 Photograph of archivist Pixie McGeachie showing onlookers community records inside the storage area during the opening of the Burnaby Community Archives at the Burnaby Village Museum. 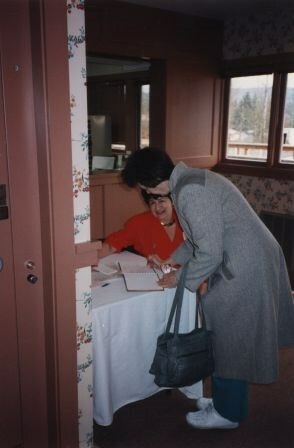 Photograph of the sign-in desk during the opening of the Burnaby Community Archives at the Burnaby Village Museum. Photograph of eight people sitting at the opening of the Centennial Pavilion on Burnaby Mountain. Identified is the Reverend Faulker from St. John Divine Church who is second from left. The rest are unidentified. 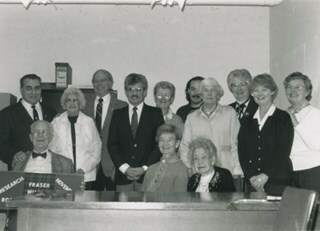 Photograph of the forty-one men and women who comprised Burnaby's BC Centennial Committee. 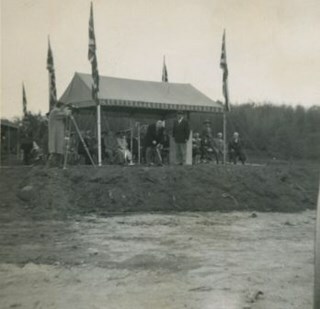 The photograph was taken during the opening of the Centennial Pavilion on Burnaby Mountain. 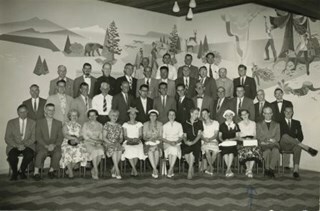 A note on the back of the photograph reads: "Burnaby's BC Centennial Committee 1958. Planned projects for BC Celebration. Our project was Centennial Pavilion on Burnaby Mountain, opened 1958." 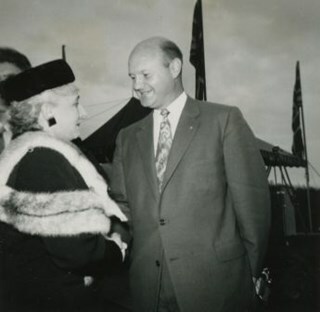 Photograph of Lilian Saxby greeting an unidentified man at the official opening of the Centennial Pavilion on Burnaby Mountain. Photograph of a group of twenty-six men seated around a table set. The men (all unidentified) were lunch guests at the Barnet Mill during the official opening of the Hastings-Barnet Road. 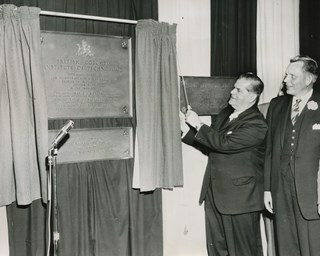 Photograph of Robert Prittie (standing in center) making remarks at the Official Opening of the Sinclair Radio Laboratories ltd. plant. 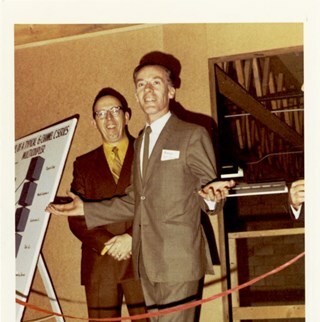 Photograph of Tom Irvine and Sam Hughes taken at the opening of Burnaby Mountain Pavilion. Note on verso of photograph reads: "Tommy Irvine on left / Sam Hughes on right / 1958"
Red stamp on verso of photograph reads: "The Burnaby Courier / 205-4795 Kingsway / Burnaby 1 B.C." Black stamp on verso of photograph reads: "Victor E. Price / 3125 Royal Oak Ave. / South Burnaby BC"
Note in blue ink on verso of photograph reads: "Tommy Irvine with / the late Sam Hughes / who was chairman of / the 1958 BC / Centennial Celebrations. 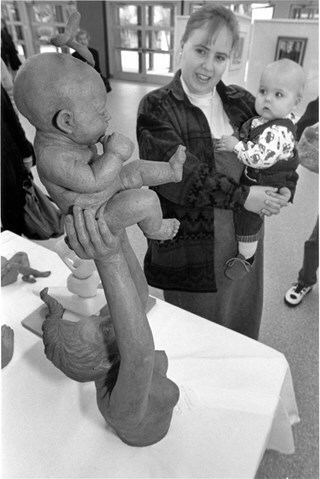 / This pic [sic] was taken / at opening of Burnaby / Mountain Pavilion - / Burnaby's Centennial / Project. Tommy was / an honoured guest / submitted / Norah Code, former Burnaby Courier / publisher"
Photograph taken at the ceremony of a wading pool opening in the Central Park Women's Insitute Playgrounds. Men, women and a boy are gathered outside in front of a building. A signboard reads, "Everybody Smokes / Old Chum / Tobacco / Billiards / Cigar Tobacco and Soft Drinks." An accompanying catalogue note reads: "'Burnaby Broadcast' Thursday, June 6, 1929. p3 / Central Park Women's Institute asked permission to make collections in West Burnaby and Inman Avenue schools to raise money to construct a wading pool in Central Park. They will be informed that the Board appreciate their enterprise on behalf of the children but regret it is against the policy of the Board to allow such collections." Inscribed on the negative and printed on the bottom of the photograph: "Ceremony of Wading Pool Opening in the Central Park Women's Institute Playgrounds, B.C. / McKay Studio. B.C. / June 29th 1929." Stamped on the back of the photograph: "Lloyd's Studio / 3966 Kingsway / / McKay, B.C. Carl. 1012." 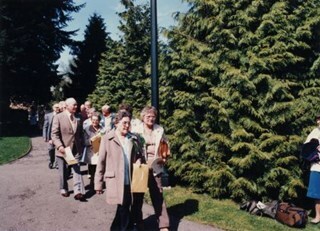 Photograph of the opening of Seaforth School, Burnaby Village Museum. An annotation on the back of the photograph reads, "Dedication ceremony, Seaforth School, Bby Heritage Village, April 1987." A row of men and women, some of whom are in costume, are standing by a podium and microphone outside a decorated schoolhouse. A sign on the side of the school reads, "Seaforth School / 1922." The school was moved from its original location at 7881 Government Road to Burnaby Village Museum in 1983, and was opened to the public in 1987. 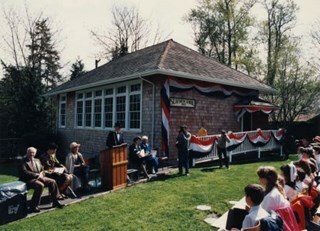 Photograph of the opening of Seaforth School, Burnaby Village Museum. An annotation on the back of the photograph reads, "Dedication ceremony, Seaforth School, Bby Heritage Village, April 1987." A crowd is seated on chairs outside a decorated Seaforth School watching men and women, some of whom are in costume, dedicating the school. There are photographers. The school was moved from its original location at 7881 Government Road to Burnaby Village Museum in 1983, and was opened to the public in 1987. 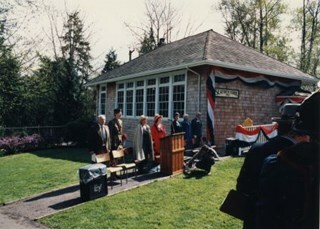 Photograph of the opening of Seaforth School, Burnaby Village Museum. 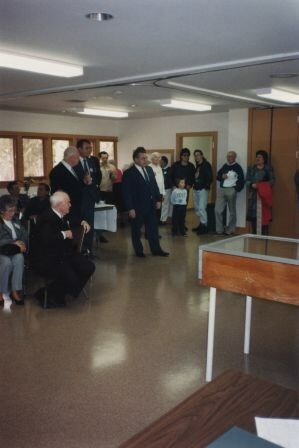 An annotation on the back of the photograph reads, "Dedication ceremony, Seaforth School, Bby Heritage Village, April 1987." People are seated in chairs outside a decorated Seaforth School looking toward a seated row of men and women, some of whom are in costume, by a microphone and podium. There are two photographers. The school was moved from its original location at 7881 Government Road to Burnaby Village Museum in 1983, and was opened to the public in 1987. Photograph of S.J. Willis (school superintendent) presiding over the official opening of Burnaby North High School, 4375 Pandora Street at Rosser Street. 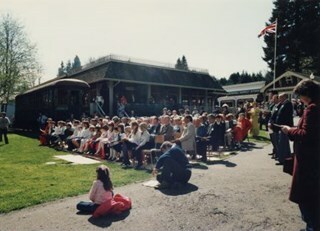 Photograph of the official opening ceremonies at Centennial Pavilion, Burnaby Mountain. A group can be seen seated beneath a large tent and two men are standing next to a podium while a photographer is taking pictures. All are unidentified. Photograph of visitors entering the schoolhouse at the official opening of Heritage Village (now Burnaby Village Museum), November 19, 1971. Photograph of exterior of blacksmith shop at the official opening of Heritage Village (now Burnaby Village Museum), November 19, 1971. Photograph of group surrounding Governor General Roland Michener at the official opening of Heritage Village at the official opening of Heritage Village (now Burnaby Village Museum), November 19, 1971. Gov. General Michener is wearing a dark overcoat in the photograph. 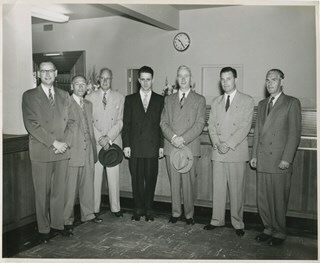 Museum Director Richard Lott is also pictured, third from the left in the crowd, wearing a grey suit. Several of the crowd members are holding cameras. Photograph looking North down the village street, showing the exterior of the bicycle & buggy shop, the general store, and Elworth House. Taken at the official opening of Heritage Village (now Burnaby Village Museum), November 19, 1971. Photograph looking North down the village street, showing the exterior of the Chinese General Imports window cases and the ice cream parlour. Taken at the official opening of Heritage Village (now Burnaby Village Museum), November 19, 1971. Photograph of the exterior of apothecary shop and the barber shop window cases at the official opening of Heritage Village (now Burnaby Village Museum), November 19, 1971. Photograph of the exterior of the print shop at the official opening of Heritage Village (now Burnaby Village Museum), November 19, 1971. 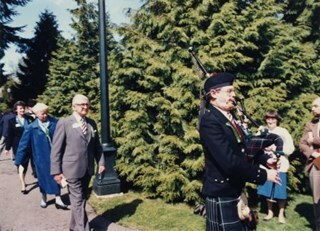 Photograph of the opening of Seaforth School at the Burnaby Village Museum, with a piper leading the procession. The school was moved from its original location at 7881 Government Road to Burnaby Village Museum in 1983, and was opened to the public in 1987. An annotation on the back of the photograph reads; "Bell Irving, Brig. / Honourary Colonel Seaforths / Dedication of Seaforth School / Burnaby Heritage Village / April, 1987 / Being "Piped" in followed by x-students." Photograph of the official opening of the Vancouver Heights Presbyterian Church at 140 Esmond Avenue at Pandora Street during the Great Depression. The opening followed years of financial difficulty and a breakaway from the Presbytery. The church was dedicated by the Lieutenant Governor of British Columbia (in top hat). 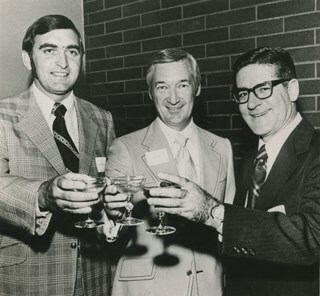 Photograph of Burnaby-Richmond-Delta Member of Parliament John Reynolds, hotel complex developer Sandy Reid and the president of Travelodge International Roger Manfred sharing a champagne toast "to the success of the new Travelodge Scottsdale" at the hotels' opening ceremonies. Newspaper clipping attached to verso of photograph reads: "A champagne toast to the success of the new Travelodge Scottsdale marked the official opening ceremonies this week. Sharing the honors were Delta MP John Reynolds, left, hotel complex developer Sandy Reid, centre, and the president of Travelodge International, Roger Manfred, who came from El Cajon, California, for the occasion." Photograph of seven unidentified men in the new Royal Bank on Edmonds. 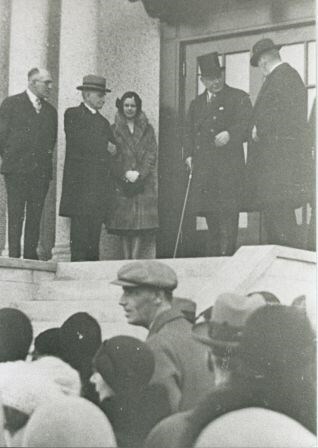 This photograph appears to have been taken during the official opening of the bank. Photograph of exterior of the bicycle and buggy shop at the official opening of Heritage Village (now Burnaby Village Museum), November 19, 1971. A 1910 McLaughlin Buick automobile is parked in front of the shop. Photograph of interior of the bicycle and buggy shop at the official opening of Heritage Village (now Burnaby Village Museum), November 19, 1971. Several bicycles are pictured, including two penny farthing cycles. Photograph of the interior of the print shop at the official opening of Heritage Village (now Burnaby Village Museum), November 19, 1971. The Mergenthaler linotype machine is featured in the photograph. Handwritten text in blue in on back reads: "Bby Village Print Shop Opening". Photograph of the official opening of Kingsway taken at Edmonds Street looking east. 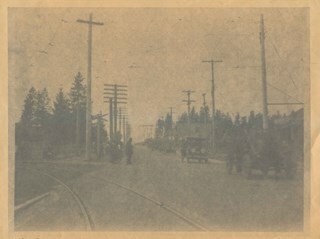 Automobiles and Interturban tracks are visible.